I’ve really enjoyed doing my Montessori inspired Great Lessons. It’s been a lot of fun, and the boys have been really excited about exploring the topics. So, even though we have finished the five Great Lessons, we wanted to continue. I decided to make up some new Great Lessons. The first one is on Water. Can you remember the elements that make up water? Water can exist in three states: solid, liquid and gas. Do you know when you’d see solid water? Liquid water? Gaseous water? Water freezes at 0o c and boils at 100o c. Celsius is named after the Swedish scientist Anders Celsius, who proposed it. Where is most of the Earth’s water? There are two ways of making something sit on water: surface tension and buoyancy. Surface tension works because water molecules are attracted to one another, they form a sort of ‘skin’, which small insects and even some lizards can run across. Buoyancy occurs when an object is less dense than water. Show how a ball of plasticine sinks, but a plasticine boat floats because the boat contains air, which makes it less dense than a solid ball of plasticine. It doesn’t stay still in the sea, it moves all the time. Water in the sea moves in currents, waves and tides. As the waves crash onto the beach, they erode rocks into smaller stones, stones into pebbles, and pebbles into sand. The waves carry small pieces of sand and shell away and deposit them at other parts of the shoreline, changing the shape of the country over time. This process is called costal erosion. 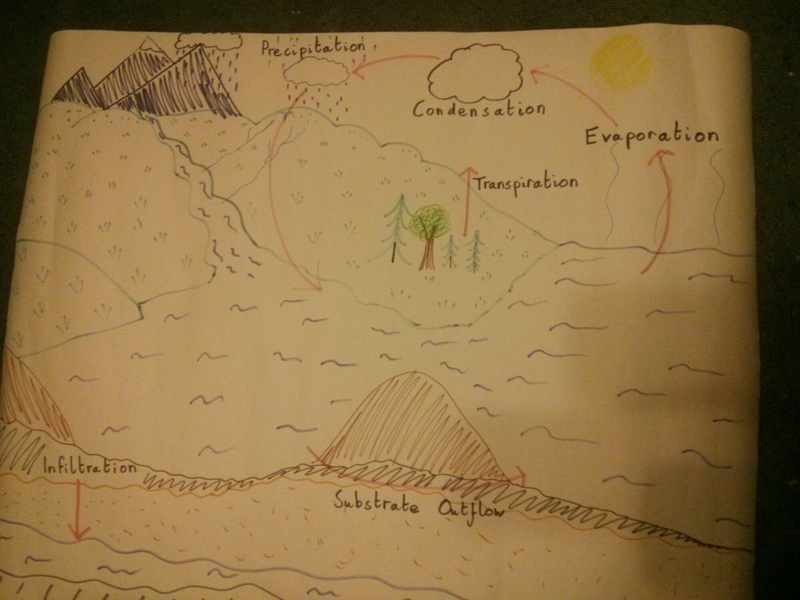 The Water Cycle is a way of showing how water moves around. Water evaporates from the sea into the air, as the air heats it and gives the molecules enough heat energy to move. In the air, the water vapour cools and changes back into water droplets. The water droplets form clouds. Water vapour is invisible, but we can see water droplets, that’s why we can’t see water evaporate from the sea, but we can see it when it gathers in clouds. When you breathe out you can’t see the water vapour in your breath, but if your breath hits something cold, like a mirror, or even the air on a really cold days, you can see a cloud. Breathe onto a mirror and demonstrate. Eventually, the water droplets fall to the earth as rain or – in colder places – snow. We call this precipitation (which includes hail and sleet). When rain hits some things, like rocks it can wear them down, this is also called weathering. Water is an unusual substance in that it expands when it freezes (most substances shrink when they freeze). If rain falls into cracks and then freezes, it can make the cracks bigger, this is another kind of weathering. Some of the water falls into reservoirs, from which people take it to use in houses, factories and farms. Water is sterilised and filtered, then pumped to houses. Filtration is when you pour liquid through a fine sieve and the impurities get caught in the sieve, leaving you with a purer liquid. Pour water with coloured sand suspended in it through a coffee filter. There are different types of mixture and different methods of separation. The sand was suspended in the water, and could be separated out by filtration. Some things like salt dissolve in water, making a solution. When we do this, we call the salt the solute and the water the solvent. Dissolve some salt in water. Salt can be separated from salty water by boiling the solution, the water molecules will boil before the salt molecules, and rise up as water vapour, the water vapour will condense when it cools down, the water molecules can then be collected. People use water to wash and drink. Then the water is drained and flushed away. It is taken to sewage treatment plants where it is cleaned again, then returned to rivers. In some countries, such as Singapore, the cleaned water is returned to the drinking water supply. Some of the water soaks into the ground. Some of this groundwater is sucked up into plants. The water carries nutrients from the soil into the plants. The plants use the water and nutrients to help them grow. Then the water evaporates from their leaves into the air – much like water evaporates off people in the form of sweat – this is called transpiration. Some of the water falls on the ground and flows downhill, forming streams, which join together to form rivers, which flow back to the sea. We’re trying something a but different this time. Rather than giving the boys free reign to choose their topics, we gave them a choice of challenges. We had hoped that the boys would be excited about taking on challenges, though Eldest was convinced that all of our offerings were ‘really easy peasy’. Eldest has decided to try and make a model aquifer, Middly is going to work on separating squash from water. 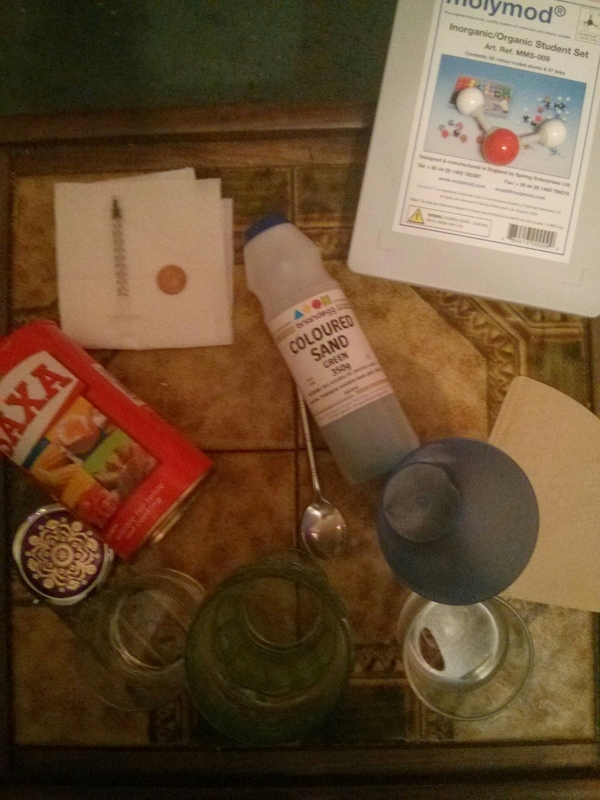 This entry was posted in Frogotter Herself, Home Educating and tagged home education, Montessori, water by frogotter. Bookmark the permalink.